On October 8 I gave a presentation to the Community Education Council in District 5 on the impact of charters on their public schools in Harlem. Our analysis, among other facts, revealed how much more disadvantaged the students are in their district public schools . The power point is below. Parents have also sent me these photographs. The first two are classrooms that Success Academy charter school took from PS 175 this year,that are now sitting empty. This further suggests that these rapidly expanding charters are indeed under enrolled as this article and this analysis of DOE school enrollment data from the Blue Book suggest-- facts that SUNY apparently ignored when they authorized 14 more Success charters last week. 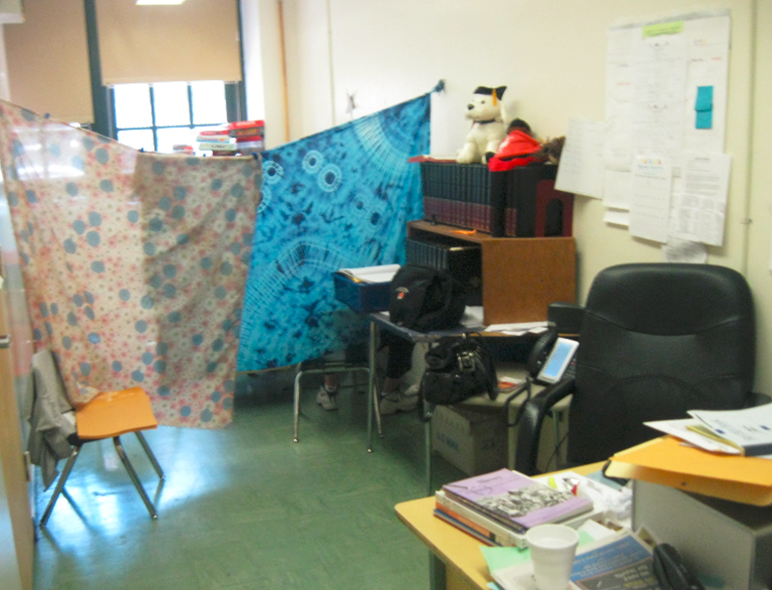 Below is another photograph, showing how the expansion of another Success charter has taken so much space within PS/MS 149 in Harlem that the speech therapist now has to share the room with the PTA office; with the two spaces only separated by sheets. I emphasized at the meeting how important it is for parents and teachers to speak out about the negative impact of charter co-locations on their schools. If you have stories to tell or photos to share, please share them with us at info@classsizematters.org. Thanks!